Looking for a cheap ticket to Vienna? 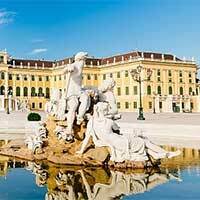 Here you can search all major low-cost airlines for cheap flights to Vienna International Airport (VIE). The Vienna International Airport is located 19km from the Vienna city center. A taxi from Vienna International Airport to Vienna center would cost EUR 30. Before you book a flight you can use Utiket to find the cheapest flights to Vienna for Austrian Airlines (OS), Lufthansa (LH), eurowings (EW), Air Berlin (AB), Turkish Airlines (TK). All flight data are real-time and accurate. Follow the links to search and book your cheap ticket to Vienna directly with the airline or one of our partnering travel agents. The Vienna International Airport or, in German, Flughaven Wien-Schwechat, is Austria's largest airport and is located about 19 km southeast of downtown Vienna. Vienna International Airport is the main base for Austrian Airlines and a hub for Eurowings and Niki. With over 20 million passengers a year it is just outside the top-20 of busiest European airports. The airport was originally built as a military airport in 1938 but replaced Aspern as Vienna's main airport in 1954. After that several large construction projects were carried out to keep up with the increasing number of passengers. Read more about Vienna International Airport . This is a list of all airlines flying to and from Vienna and how many flights and destinations they serve. You can see a complete list of airlines and flight options to Vienna. Need place to stay in Vienna?